Double Draw Tarot Bags - Sunburst Double Draw Tarot Bag - Tarot Bags, Tarot Cards, Cloths, & More! Brilliant yellows and oranges depict the sun's rays on this fascinating new tarot bag. It's an easy match for tarot decks with orange and yellow colors in the illustrations or borders. Such symbolism may bring a new brightness and insight to your tarot reading experiences. 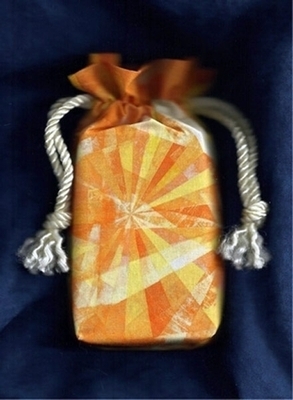 Size: The double draw tarot bag measures about 7-1/2 x 5 x 1 inches. It fits most standard sized tarot decks that are up to 3-1/4 x 5-1/2 inches. There is an one-inch ruffle on top and an one-inch gusset (squared off) at the bottom. It is made of cotton and closes with two triple twist cord drawstrings.